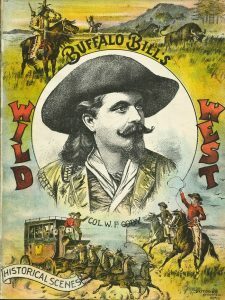 Buffalo Bill Cody was a famous character in the ‘wild west’ of America in the 19th century. After a career supplying railroad workers with bison meat he began to perform in stage shows until he founded Buffalo Bill’s Wild West, a circus-like attraction that toured annually. Cody brought the show to Europe four times between 1887 and 1892, and visited Glasgow in 1891 for almost four months where his company performed nightly at the East End Exhibition Buildings in Dennistoun. The cowboys and Indians were easily recognisable on the streets of Glasgow. Bill attended a match between Rangers and Queen’s Park at Ibrox in November 1891 which ended in a 3-0 victory in favour of Queen’s Park. The Scottish Referee newspaper marked the occasion with a poem. I’d like my “bucks” to have a shout. For more information about Bill’s time in Glasgow visit the Scottish National Buffalo Bill Archive.